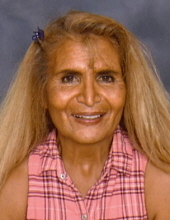 Alejandra Margarita Hurd, age 72, of New Paris, OH went to be with the Lord on Friday, March 29, 2019 at her residence after an illness. She was born October 5, 1946 in Torreon, Coahuila, Mexico to the late Pablo and Margarita Lopez. Margarita worked as a custodian for Eaton Community Schools at East Elementary where she dearly loved the children; she was an avid walker; and a devoted Christian, often stating she was a “simple little lady that loved the Lord with all her heart”. In addition to her parents, she was also preceded in death by her sister Esperanza Kelty. She is survived by her husband of 47 years, Allen E. Hurd; her children: son Dennis (Angela) Greenfield, daughter Ola (Jim) Angel, son Robert (Tracy) Hurd, daughter Maria (Jason) Sibila; son Allen E. (Bethann) Hurd, Jr., son Clay (Wendi) Hurd, son Steve (Stephanie) Hurd, and daughters Angel Hurd, Rebekah Hurd, Elizabeth Allison and Sierra Allison; numerous grandchildren and great grandchildren; and several brothers. Funeral service will be held at 3:00 pm on Sunday, April 7, 2019 at the Girton Schmidt & Boucher Gard Funeral Home, 226 West Main Street, Eaton, OH. Burial will be at Mound Hill Cemetery in Eaton. Visitation will be held on Saturday, April 6, 2019 from 4:00 to 7:00 pm at the funeral home. Memorial contributions may be sent to American Cancer Society. Online condolences may be sent to the family by visiting www.gsbfuneralhome.com. To send flowers or a remembrance gift to the family of Alejandra Margarita Hurd, please visit our Tribute Store. "Email Address" would like to share the life celebration of Alejandra Margarita Hurd. Click on the "link" to go to share a favorite memory or leave a condolence message for the family.